This selection contains all of our 15 Pin VGA Video Cables. 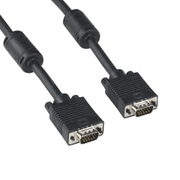 The Basic VGA Cable is lightly shielded with mylar and is good for basic lower quality video applications. The SVGA cables are triple shielded, with both Mylar shielding and a braided shield as well as having the Red/Green/Blue wires being made of a mini-coax, and most of these having ferrite beads on each end. We can easily guarantee that you will not have video loss on the SVGA cables. We also have the SVGA calbes with 3.5mm Stereo Audio. This provides and easy way to get video and audio from your laptop or PC to some of the TV's out there. You will want to verify that your setup allows for these connections, as not all TV's support this.